To kick off the new year, Breech Birth Network are providing a study day in Norwich on 14 January 2017. If you’ve been wanting to encourage your obstetric colleagues or trainees to attend training, this will hit the spot. Our teaching team includes Dr Anke Reitter, FRCOG, Shawn Walker, RM, Victoria Cochrane, RM, and Mr Eamonn Breslin, MRCOG. Send your colleagues the link to our Eventbrite booking page, with a personal invitation! Or download a poster for your work environment. This study day for obstetricians, midwives, paramedics and students will provide an engaging and interactive update on professional skills to facilitate physiological breech births, planned or unexpected. The study day would be especially useful for clinical skills teachers who want to include physiological breech methods in professional skills updates or student lessons, due to access to resources after the workshop. The focus is on collaborative, multi-professional working to improve the safety of vaginal breech birth using the skills of all maternity care professionals. Hosted by the University of East Anglia University Midwifery Society. Profits from the study day will benefit the UEA Midwifery Society annual charity, the Orchid Project. See here for directions to the Edith Cavell Building, and to Norwich from further afield. Dr Anke Reitter, FRCOG, IBCLC, is the lead Consultant Obstetrician and Fetal-Maternal Medicine Specialist at Krankenhaus Sachsenhausen, Frankfurt am Main. Although originally from Germany, she worked in India and the United States during her medical studies, and in England (including Liverpool) for 4 years during her obstetric training. After returning to Germany, she specialised in perinatal medicine. Prior to her move to Krankenhaus Sachsenhausen, where she initiated a new breech care pathway in a unit which had not supported breech births for years, Reitter practiced in the Obstetrics and Gynaecology department at the University Hospital Frankfurt. A large observational study of the hands/knees breech births in Frankfurt is due to be published soon in the FIGO journal. Her special interests lie in breech, multiple pregnancies, high risk pregnancies and prenatal ultrasound. She is an internationally known speaker, teacher and researcher in several areas, but especially breech birth. Shawn Walker, RM, MA is a UK midwife and PhD candidate researcher who studies how professionals learn skills to safely facilitate breech births. Clinically, she has worked in all midwifery settings – labour wards, freestanding and alongside birth centres, and home births. She led the development of a breech clinic pathway at the James Paget University Hospital (2012-2014), where she worked as a Breech Specialist Midwife. Her research focus on breech birth is part of a wider interest in complex normality – working with obstetric colleagues to enable women at moderate and high risk to birth and bond physiologically where possible. She currently works as a bank midwife at the Norfolk & Norwich University Hospitals NHS Foundation Trust, in addition to periodic teaching, consultancy and breech support across the UK and internationally. Victoria Cochrane, RM, MSc is the Consultant Midwife for Normality at the Chelsea and Westminster NHS Trust. RM, MSc, Supervisor of Midwives. The majority of her clinical career has been working in and developing caseload and continuity models for women and their families in the community. She is deeply passionate about working with colleagues to support women making pregnancy and birth choices that sit outside of routine guidance. In her current role she works to support normality for women in all aspects of pregnancy and birth. Breech presentation became a special interest in 2009 when her daughter spent a few weeks in that position at the end of pregnancy; it’s amazing what one can learn in a short space of time when faced with challenging choices. This led to carrying out a cross-site service evaluation of the management of undiagnosed breech for her MSc dissertation. Reitter, A., Daviss, B.-A., Bisits, A., Schollenberger, A., Vogl, T., Herrmann, E., Louwen, F., Zangos, S., 2014. Does pregnancy and/or shifting positions create more room in a woman’s pelvis?Am. J. Obstet. Gynecol. 211, 662.e1-662.e9. Walker, S., Scamell, M., Parker, P., 2016. Standards for maternity care professionals attending planned upright breech births: A Delphi study. Midwifery 34, 7–14. Walker, S., Scamell, M., Parker, P., 2016. Principles of physiological breech birth practice: a Delphi study. Midwifery 43, 1-6. FREE DOWNLOAD until 13 December. This entry was posted in Breech Skills, Education, Study Days and tagged Frankfurt, Norfolk, Norwich, skills/drills, Training on October 30, 2016 by midwifeshawn. Posterior arm born, anterior arm high, shoulders in A-P diameter – help is required! In July, Gerhard Bogner of Salzburg presented data at a Breech Birth Network study day. Although the series is small, the data indicate that when the mother is in all fours position to birth a breech baby, approximately 70% of those births will occur completely spontaneously, eg. without the need to perform assisting manoeuvres at all. Use of upright positioning also reduced the rate of maternal perineal damage from 58.5% to 14.6%, which is actually better than cephalic births! The reduced need for manoeuvres potentially reduces iatrogenic damage to babies associated with interference at the time of birth, such as birth injuries and inhaled meconium. That’s great for that 70%, but what about the other 30%? The babies born with upright positioning in Bogner’s study had a slightly higher rate of low cord blood gases, indicating hypoxia, although no consequences for the infants or differences in 5 minute Apgar scores were observed. If a woman is birthing her baby in an upright position, how do we assist the birth confidently and safely when delay is identified? How do upright manoeuvres differ from those performed when the woman is supine? To address a growing need for more practical training in upright breech birth, City University are offering Physiological Breech Birth Workshops in London and taster days around the country. The next one is on 2nd of December at the Whittington in Central London. Lots of hands-on training with a small group of doctors and midwives committed to extending breech skills. We also post conferences and workshops provided by others when we can. Several people have been in touch to ask about the How and When to Help handout. I disabled the link because it is constantly being updated! Please feel free to download this one and use it in your practice area. But keep in mind understanding in this area is constantly expanding, and this is just one midwife’s current approach. I’m working on research to understand others’ approaches as well, but it will be some time until this is finished. Look out for two articles appearing this month. In The Practising Midwife, I present a summary of current evidence related to ECV (external cephalic version), with some excellent photos provided by Dr Helen Simpson and Midwife Emma Williams of South Tees Foundation Hospital. In Essentially MIDIRS, Mariamni Plested and I talk about issues in providing innovative care for higher risk birth choices. Finally, shameless plug: Today (30/9/14) is the last day to vote for my, um, remarkable cousin Jake in the NRS National Model Search. Read all about him here, and then click on the link at the bottom of the article to VOTE FOR JAKE! Update: He won! Go Jake! This entry was posted in Breech Skills, Research and tagged all fours, breech skills, extended head, How and When to Help, London, manoeuvres, nuchal arms, perineum, Salzburg, skills/drills, spontaneous birth, upright on September 30, 2014 by midwifeshawn. When women are in upright positions, many breech births will proceed completely spontaneously because the birth canal follows the flow of gravity. However, the attending clinician may need to assist, either because maternal effort no longer results in steady progress, or because the baby appears compromised and assistance will result in a quicker delivery. In this blog, I describe one manoeuvre I have learned to help in upright breech births. In this scenario, the maternal pubic arch is directly behind the baby’s occiput. When pressure is applied to the baby’s torso along the clavicular ridge, guiding the baby’s body straight back through the mother’s legs, the pubic arch will push the occiput up and forward. This causes the aftercoming head to flex and descend, following the curve of the birth canal. The sternocleidomastoid muscles (SCM), responsible for head flexion, attach to the superior aspect of the clavicle and keep the head in alignment throughout this process. Gluteal Lift – If descents stops with the perineum tight on the baby’s forehead (bregma), and the shoulder press alone has no further effect, an assistant can augment the manoeuvre by lifting the woman’s buttocks up and out. This lifts the perineum over the bregma as the primary attendant performs the shoulder press, moving the baby in the opposite direction. This assisted manoeuvre is especially helpful when the woman is obese, or the perineum is especially tight and intact. The feeling and effectiveness of this manoeuvre is very easy to replicate using an obstetric model, turned upside down, as in the video below. Preserving an intact perineum. An intact perineum helps to maintain beneficial fetal flexion, and routine episiotomy should be avoided for this reason. 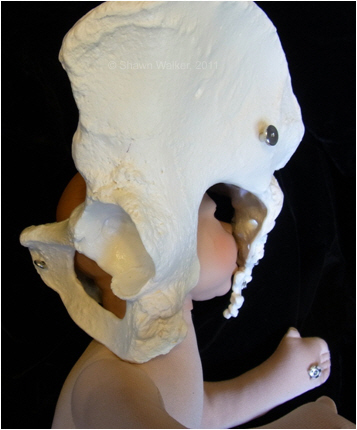 However, when the aftercoming head has descended onto the perineum, reaching the maxillary or malar bones to perform a modified Mariceau-Smellie-Veit (MSV) can be difficult. Therefore, many clinicians will cut an episiotomy early in order to avoid cutting one while the baby’s face is on the perineum. However, this is not necessary. When the chin is visible, pressure on the maxillary bones through an intact perineum is possible, in combination with upward pressure on the occiput behind the pubic arch, enabling descent to continue. However, the shoulder press is more effective. 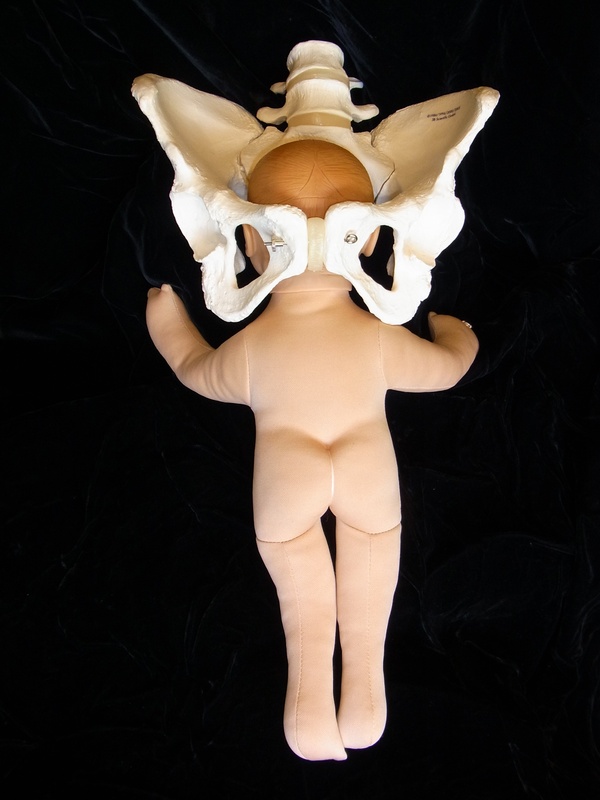 Clinicians who are inexperienced or untrained in manoeuvres specific to upright birth will be tempted to pull down on the baby’s torso to deliver the head. However, this does not follow the direction of the birth canal in the same way as the shoulder press as described. Pulling rather than pushing is potentially more likely to result in severe perineal damage, and may also cause cervical nerve damage in the baby due to increased resistance from the intact perineum. Fractured clavicle. When applying pressure on the clavicle, fracture is an obvious potential risk, although neither I nor those I have learned from have reported fractured clavicles resulting from the use of this manoeuvre. This potential risk can be minimised by spreading the fingers to apply even pressure along the entire ridge, or by applying pressure with fingers or thumbs at the distal aspect, near the glenohumeral joint. The pressure exerted is firm but is not significantly different to that applied when delivering an anterior shoulder in a supine cephalic delivery, and therefore no more likely to result in trauma. The shoulder press minimises the amount of force needed to achieve delivery by promoting maximum head flexion and descent in the direction of the birth canal. The shoulder press as described, on its own, may not resolve a dystocia caused by a deflexed or hyperextended aftercoming head. 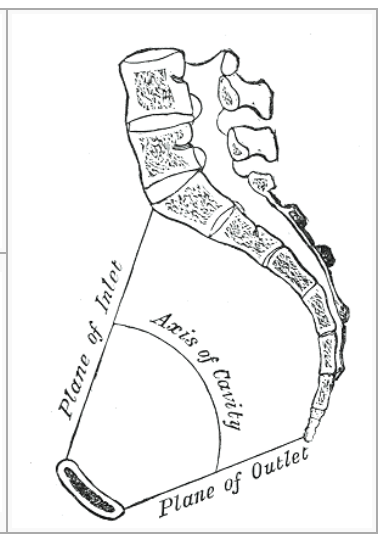 A very high chin, pointing upwards, identifies a hyperextended head; only the bottom jawbone (resembling a ‘bird beak’) is felt at the very top of the maternal sacrum. If the deflexed head has impacted at the pelvic inlet, the baby’s whole body may need to be lifted in order to flex and/or rotate the head to oblique so that it can enter the pelvis before the shoulder press is useful. Additionally, suprapubic pressure performed by an assistant may help flex the head enough to pass through the pelvic inlet. The practice of supporting breech births with the mother in an upright position is somewhat controversial, as minimal research evidence regarding effectiveness exists. Although breech experience is generally at a very low level, most clinicians are only trained to perform lithotomy manoeuvres, and therefore the RCOG recommend lithotomy as the preferred maternal position (RCOG 2006). However, increasingly women are requesting freedom of movement and their own preference to be upright, which is potentially a more satisfying birthing position (Thies-Lagergren L et al 2013). In the absence of evidence that such an approach increases risks, introducing upright manoeuvres into mandatory training will enable this option. In addition, through discussions with other midwives and participation in the risk management process for various Trusts, I have been informed of several cases of undiagnosed breech births where women were instructed to get onto their backs on their floor following the diagnosis of a breech in labour, due to lack of an obstetric bed in that setting. In some cases, this has been associated with severe delay in delivering the aftercoming head. In true lithotomy, head flexion is promoted by allowing the baby to hang off the end of the bed, where the maternal pubic arch again is responsible for lifting the occiput as gravity gently pulls the baby through the birth canal. This cannot occur on the floor, and the head becomes deflexed. In these cases, the midwives were only trained to perform lithotomy manoeuvres, and instructed that guidelines required them to manage breech births in this way, but the births occurred in settings with no obstetric bed. Providing mandatory training in upright breech to those working in midwifery-led settings will potentially improve outcomes in emergency cases in the short term, and increase maternal choice in the long term. I first learned about this mechanism from Dr Anke Reitter, FRCOG, of Frankfurt, Germany, and Jane Evans, an experienced UK Independent Midwife. At the University Hospital Frankfurt a similar technique is called ‘Frank’s Nudge’ after the lead obstetrician, Prof Frank Louwen, who introduced the upright management of breech birth to their unit. I do not refer to the manoeuvre as ‘Frank’s Nudge’ because my technique may differ slightly, and that team has yet to publish their own description of their manoeuvre. Some have described the mechanism as a reflex action, but my hands have experienced it as purely mechanical, and much more effective than Mariceau-Smellie-Veit when women are upright. I can only speak for my experience. RCOG (2006) The Management of Breech Presentation. RCOG Green-top Guidelines, No. 20b. London, Royal College of Obstetricians and Gynaecologists. Thies-Lagergren L et al (2013) Who decides the position for birth? A follow-up study of a randomised controlled trial.” Women and Birth 26(4): e99-e104. This entry was posted in Breech Skills, Emergencies and tagged all fours, breech skills, clinical skills, extended head, flexion, gluteal lift, How and When to Help, manoeuvres, shoulder press, skills/drills, standing on June 15, 2014 by midwifeshawn. Introducing more support for planned breech birth in your hospital setting? This post is for you. As a result, health care providers are needing to re-skill in the facilitation of breech birth, and in a way which matches women’s expectations. This requires introducing entirely new skills to manage breech births when the mother is upright and active, as women who choose to birth vaginally usually expect to be. But transitions can be de-stabilising. Doing things ‘as they are always done’ provides some protection because team members are familiar with their roles. Each professional knows her/his place on the team. They are familiar with the range of events that might happen in this scenario, and they know by repetitive practice exactly how they will need to communicate and respond. The emergency caesarean section for the undiagnosed breech discovered at 9 cm – the team has been here before many times, and swings comfortably into action. In contrast, a planned breech birth is novel territory. This is even more the case if the woman has planned to be upright and active, as many teams will have rehearsed emergency breech drills with the mannequin in a lithotomy position (legs in stirrups). Therefore, teams supporting this choice will need to employ different strategies to ensure effective teamwork around the time of birth. Ideally, the entire second stage and the birth of this breech baby will be primarily supported by three people. These three should be familiar with and aligned with the woman’s birth plan and each other, as any task or relational conflict will compromise decision-making ability (de Wit et al 2013, Puck & Pregernig 2014). They should each have a clear understanding of what their role in the team will be, and they should have rehearsed together the management of some common emergencies. They should have clear eye contact with each other throughout the birth, in order to confirm in an unobtrusive way the on-going evaluation that the birth is going well, or to prepare each other for the possibility that it might not be. 1) Management – This person is primarily responsible for facilitating the birth, and may be an experienced midwife or an obstetrician. Ideally, this person will be known to the woman and have experience with breech birth in general (and the type of birth the woman has requested). The birth facilitator will be intimately familiar with the woman and her wishes, as well as the mechanics of breech birth, how to anticipate possible problems, and how to assist when required. They are responsible for co-ordinating care and preparing the rest of the team to assist when required. 2) Support – This person, usually a senior midwife, is responsible for taking over monitoring of the woman’s and baby’s well-being throughout the second stage, frequently relaying this information to the rest of the team and reassuring the woman. Positioned beside the woman, they are an important communication bridge, especially when the woman is in a kneeling position, facing away from the person managing the birth. In this position, the support professional is also placed to assist with applying suprapubic pressure and/or change of maternal position. 3) Perspective – This person is responsible for documenting the birth and providing a second evaluation of progress. This role requires breech experience because in order to document appropriately and accurately, the person needs to understand what they are seeing. Similarly, in order to assist with the evaluation of progress, this person needs to be familiar with normal progress in a breech birth. Because of their perspective, this person is also an important communication bridge with the rest of the team outside the door (eg calling for further help, alerting paediatricians to possible complications, etc. ), and may alert the managing professional to potential problems. Therefore, this role is often taken by the most experienced person in the room, such as the obstetrician or the experienced midwife who is supporting another midwife to develop her skills. Most normal births are attended by two midwives, and this is more than adequate. But a breech birth is not an everyday occurrence. Documentation will need to be of a gold star standard. Yet in most hospitals, each person in the room will still be developing their skills with breech and will therefore need to concentrate on the task at hand, making attendance to paperwork tricky. It is also easy to become enthralled with the beauty of an unfolding breech birth. Therefore, supporting breech births with a primary team of three strengthens a situation made vulnerable by its novelty. A triangle is one of nature’s strongest structures; this mini-team is strengthened, given a base by the addition of perspective. Given the importance of documentation in any higher-risk birth, triangulation of data (eg strengthening the accuracy by using different sources) also makes practical sense. The triangulated team increases everyone’s safety in a novel situation. Interestingly, many women instinctively form their own triangles, involving two supporters. 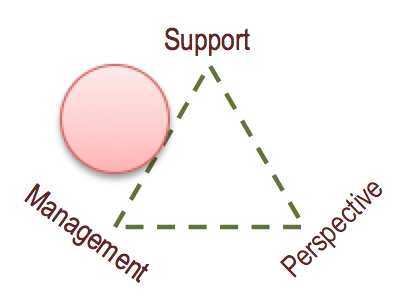 The third person in this triangle also provides additional support, strength and perspective for both her and her partner. Continuity of carer – ensuring a woman knows the professional who will be facilitating her birth, and ideally the entire team – has known, evidenced benefits. Fewer interventions, greater satisfaction. Knowing who else will be in the room, and what their role will be, will also help the woman to feel more relaxed and reassured about the upcoming birth. Continuity has benefits for providers as well, especially when it comes to facilitating non-standard care. A number of sources have suggested on-call teams for breech births as the way forward (Kotaska 2009, Daviss et al 2010) and on-call midwives are a middle ground. Especially when experience is minimal, preparation is key. Where an on-call team is not available, the entire team who will be attending the birth should be identified when the woman is admitted to hospital, and again at handover if appropriate. This team should have a thorough discussion about roles and responsibilities, and a run-through of the ‘fire drill’ if things do not go as planned, well before second stage requires the additional team members to attend. The team should meet afterwards to review the birth and identify if any group work issues have been identified that can be improved for future births. This review should involve the obstetric labour lead, a midwifery manager and/or risk management midwife if the breech service is new to the maternity team. A reflective approach in the early stages will pay off in increased safety and a more confident, united team in the long run. Teamwork is crucial to the safety of breech births. Michael West has written extensively about the characteristics of ‘real teams,’ as opposed to ‘pseudo teams.’ Real teams have clear, shared team objectives; role interdependence and role clarity; and they meet regularly to review and improve performance (West, 2014). If we are to successfully change the culture of breech birth, and support women as safely as possible as we develop our skills and experience, we must function as real teams. You may also be interested in this article: Plested M, Walker S. Building confident ways of working around higher risk birth choices. Essentially MIDIRS 5(9)13-16. How have you prepared your teams to support planned breech births? This entry was posted in Breech Skills, Risk Management and tagged all fours, clinical skills, continuity, eye contact, for L, manoeuvres, reflection, roles, skills/drills, team work on April 9, 2014 by midwifeshawn. I always smile when people say, “It’s all well and good to support natural breech birth, but what happens if the head gets stuck?” Those of us who are supporting woman-centred, modern breech birth take an equally realistic view about the need to intervene in a skilled and confident manner when help is needed, although we are probably more realistic about the frequency with which such intervention is required. We also obsess about creating trusting relationships and environments which facilitate more spontaneous, easier births, with the end result that we need to use our skills less often. However we sometimes rely on these skills to achieve a safe outcome. Therefore we share our experiences with others, for when they might be needed. And we know that supporting others to confidently support more breech births will create new knowledge which will in turn help us to improve our own practice. The baby’s head was hyperextended at the time of delivery, but not before. Woman on all fours, no progress with the next contraction, no spontaneous movements from the baby to assist his own flexion. Neither the midwife managing nor the Registrar who was supporting could reach the baby’s chin, just what felt like a bird beak (the lower jaw bone) pointed up to the sky, so Mariceau-Cronk was not an option. All present were fairly inexperienced, and no training aids were available, so the decision to get the woman upright was instinctive. The decision to apply suprapubic pressure while doing so was based on RCOG guidelines about how to help when the woman is in lithotomy, transcribed to the current situation. The occiput was felt during suprapubic pressure. Then suddenly the baby’s head dropped into the pelvis, and was immediately born wearing his placenta like a hat. Several minutes of resuscitation were required. Baby recovered quickly and well. Following on from this story, I returned to the sources I use over and over again. Anne Frye’s Holistic Midwifery described how some midwives get the woman upright (for breech and shoulder dystocia) because this tightens the abdominal muscles, promoting head flexion. So someone else has a theory for how it works. There is also increasing radiological evidence that when upright or prone (e.g. shoulders, pelvis and knees in a straight line), the pelvic inlet is largest, while squatting significantly enlarges the mid-pelvis and pelvic outlet. The strategy of assisting the woman to move into an upright posture and use suprapubic pressure may have resulted in an even better outcome if performed earlier, as soon as the dystocia was identified. The next push I gave it everything I had and rumping happened very quickly followed by the body; the relief of the pressure was immense. Two sharp sensations happened which were the legs releasing, I remember looking through my legs and seeing a little body! Then there were a few sharp uncomfortable movements which were caused by the baby wriggling its arms out. My contractions at this point had stopped. This scenario was slightly different, but maternal movement was again helpful. Jane Evans, a midwife with many years of breech experience, writes and talks about how her understanding of the physiology of breech birth has been informed by listening to and close observation of women (Evans 2012a, Evans 2012b). Listen to women. Listen to midwives. Share your stories. Share your skills. Feel free to share your own stories in the comments below. Community support for breech professionals is available via a Breech Birth Network Facebook group. Michel, S. C., Rake, A., Treiber, K., Seifert, B., Chaoui, R., Huch, R., . . . Kubik-Huch, R. A. (2002). MR obstetric pelvimetry: effect of birthing position on pelvic bony dimensions. AJR Am J Roentgenol, 179(4), 1063-1067. doi: 10.2214/ajr. Anne Frye’s Holistic Midwifery: A Comprehensive Textbook for Midwives in Homebirth Practice, Vol II is now available to download as a PDF, you lucky ducks! My father still complains about having to transport the heavy tome across London on the underground when he brought it to me from America one Christmas. This entry was posted in Breech Skills, Emergencies, Research and tagged clinical skills, extended head, How and When to Help, manoeuvres, skills/drills on June 14, 2013 by midwifeshawn.